This two-pages factsheet shows the impact of tobacco on working conditions. On the one hand, it covers the exposure to secondhand smoke at work places. 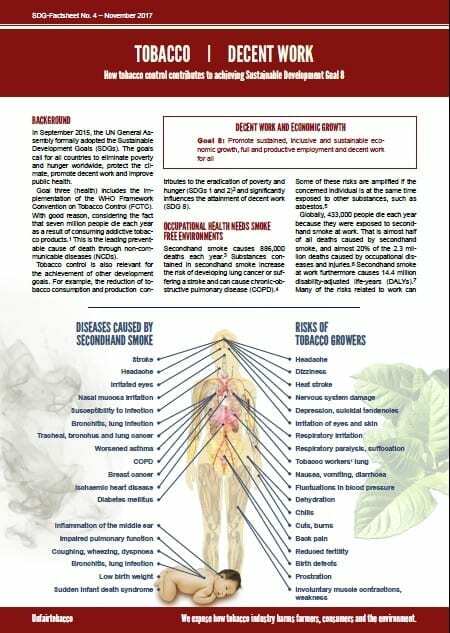 On the other hand, it describes health risks in tobacco growing. The graphic lists these health risks and contrasts them with diseases caused by secondhand smoke. Additionally, the factsheet explains how tobacco control measures can contribute to achieve the Sustainable Development Goal 8. Globally, 433,000 people die each year because the were exposed to secondhand smoke at their workplace. These deaths would be entirely avoidable, if all workplaces were smoke free.